Attam is the star day when the Onam celebration begins. On this day, people create a floral rangoli called Pookkalam at their entranceway using many different flowers. It is not just done in homes but also in offices and educational institutions. There are even Pookkalam competitions where people compete for the best Pookkalam design. Simple to intricate designs are used with flowers such as marigold, roses, jasmine, hibiscus etc. in addition to materials like saw dust to build the foundation. Kaikotti kali also known as Thiruvathira kali is a truly indigenous dance form of Kerala and is performed by women dressed in white sari called Set and gold jewelry around a “Deepam”, which is a traditional Kerala lamp. It is usually performed in a group of 8 to 12 women. Another form of dance practiced here during this time is the 'Pulikali' or 'Kaduvakali' where men paint themselves like tigers in bright yellow, red and black colors and dance ferociously to the music of 'udukku' and 'thakil'. 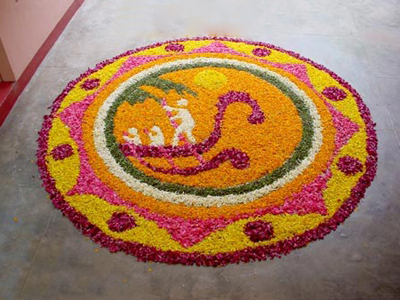 Onam games are very varied and offer wide variety of entertainment. The outdoor games that are popular are 'Talappanthukali' (ball game), 'Kayyankali' (one-to-one unarmed fight between men), 'Attakalam' (fight between men in groups), Ambeyyal (archery) and 'Kutu Kutu' (Kabaddi). 'Kummattikali' is another game played typically by men where they clad themselves with attire made by using plaited grass and a big wooden mask. The lip-smacking feast called Sadya is the prominent part of this India festival. Mostly the meals are vegetarian but non-veg items are also prepared. 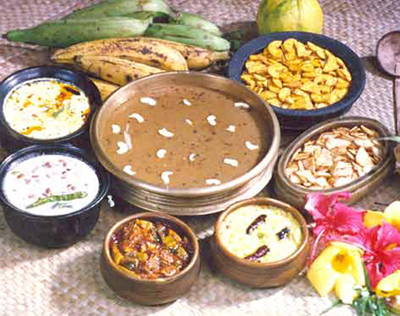 The elaborate Sadya consists of brown rice and three main curries with many side dishes. In addition, there is melt-in-the mouth payasam served at the end of the feast. It is a belief that every Malayalee should eat Onam feast no matter what he or she has to sell to do it. Boat race or “Vallamkali” on the popular snake boat is conducted on the star day of Uthratadhi. Oarsmen take part enthusiastically and they oar the boats ferociously. Using Yoovite, you can send an Onam invitation online.